Joseph Pizzorno, ND, coauthor of “The Encyclopedia of Natural Medicine” and “Textbook of Natural Medicine,” has dedicated his medical career on keeping people healthy the natural way. In a field which many are quick to judge as “quack” or unaccredited, Pizzorno leads the fight against commonly-practiced medicine in which most patient visits are concluded with a prescription or two. Pizzorno is a naturopathic practitioner who claims that many of society’s ailments and diseases are the result of “advances” in science in the form of chemicals and toxins produced in the body as a result. From research and an encouraging mentor, Pizzorno founded Bastyr University, one of the nation’s first fully-accredited university for physicians practicing natural medicine. He remained there for 22 years, serving as the University’s president. In an age of instant gratification and convenience, Pizzorno passionately advocates for individuals to take charge of their health through preventative measures before these toxins wreak havoc on our bodies. His “Toxin Solution” focuses on an eight-week program designed to “detox your life.” Pizzorno presents a “four-pronged approach” to accomplish this feat, including: “1) Understanding where toxins are found and how they cause disease; 2) Preparing your detoxification systems to eliminate toxins quickly and safely; 3) Undergoing intense detoxification; and 4) Following simple guidelines for a toxin-free life.” The book starts by giving readers a foundation to toxins and their environmental effect and gradually guides the reader to use this foundation to his/her detoxification journey. One question the average reader might have is: where are these toxins found? Pizzorno stresses the answer is as simple as your health and beauty products, the gas you breathe in as you’re filling up your car, cleaning and home-building materials, and fruit and vegetables sprayed with chemicals before arriving at the nearest produce section. Beginning with the first chapter, readers are introduced to research via case studies, graphs, charts, and tables to emphasize the importance of Pizzorno’s message. The author does not want his readers just to understand where these toxins exist; he also tries to educate his readers with scientific knowledge as to prevalent diseases that are derived from such toxins. 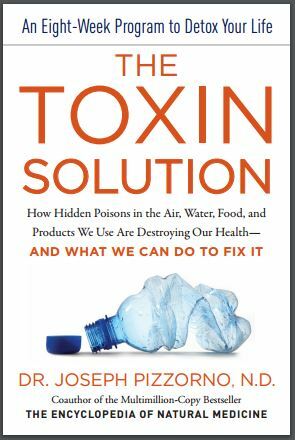 Chapter One’s “How Toxins Ruin Your Health” for example, states that 33 percent of Americans are at double the risk for contracting ALS (“Lou Gehrig’s disease) due to a high amount of lead in their body. Pizzorno makes the point that if there is more education and an increased awareness of these toxins – such as the correlation and causation between cigarette smoking and lung cancer – American women will think again before reapplying lipstick – a common beauty staple that contains .09- to 3.06 parts per million levels of lead. What Pizzorno nudges toward is an intense preparation for his eight to nine- week “Toxin Solution” program. Though the first two chapters are meant as an informative guide to help readers understand the causes of toxic overload, the author stresses that a thorough level of scientific understanding does not preclude readers from participating in his detox “Solution.” He gives readers two options: to go directly to Chapter Three – “The Two-Week Jumpstart Diet”- or to follow the detailed appendixes, particularly the “Protocol Summary.” This advice should reassure readers that while the information is there, it is not meant to intimidate those feeling self-conscious about their potential lack of scientific expertise. Pizzorno’s detoxification program begins with his “Two-Week Jumpstart Diet;” the remaining weeks are broken up into two-week periods dedicated to three specific organs: the gut and digestive system, liver and kidneys. An optional ninth week is included as “an intense full body detox.” A meal plan is detailed for the first two weeks and several suggested foods and vitamins are included for weeks three through eight. For the reader interested in convenience at the grocery store, these types of shopping lists are invaluable. It is smart of Pizzorno to address the lingering question: How much will all this cost? Though he does address alternatives to his detoxification program -specifically to college students who would not be able to afford the bulk of the program’s ingredients – buying “wild-caught” fish, organic food, gluten-free items, non-toxic health and beauty products and multivitamins are expensive. They’re also difficult to find in one shopping trip – unless you’re going to Wegman’s, Whole Foods or Trader Joe’s. Several of Pizzorno’s suggestions to improve the average American’s food intake are logical — although eating more fiber, drinking more water, avoiding GMOs and processed foods and having a daily multivitamin are not revolutionary ideas. Many would dispute even taking a multivitamin on the assumption that many key nutrients are already found in food if cooked and prepared correctly. Most individuals, especially those in the health and wellness industry, would consider themselves lucky (and disciplined) to consistently “shop the perimeter” of their local supermarket. Yes, “The Toxin Solution” does a good job promoting this ideal – even if it does lean heavily on the (expensive) organic argument when it comes to produce. Unfortunately, its standards are a tad ambitious for a general audience who are more in tune with “Fast Food Nation.” Those agreeing with Pizzorno’s standards already shop at Wegman’s, Whole Foods, or Trader Joe’s – freshly prepared beet juice waiting at home. The information on this website is not intended to replace a one-on-one relationship with a qualified health care professional. All material provided on CompendiumDX.com is provided for informational proposes only and is NOT a substitute for medical diagnosis, advice or treatment. Consult your physician regarding the applicability of any opinions or recommendations with respect to your symptoms or medical condition.